Faster than any other service in The Hague! Replacement lock, cylinder or key? No problem! And we speak excellent English! Have you locked yourself out (lockout) and do you need a reliable and affordable Locksmith in The Hague / Den Haag? Looking for a service that doesn’t overcharge or damage your lock unnecessarily? You have come to the right place! Have you lost your keys or forgotten them inside? Has the door slammed on you? Is your lock broken, jammed or not working properly? You can rely on us to assist you quickly and professionally at any time of day or night, in all weather, in the weekends and holidays. Our technicians are highly qualified! Incidentally, they really enjoy their work, especially a technical challenge! We will quickly open any door and/or replace locks, cylinders or keys. Moreover, we carry out many repairs on site and make appointments or take orders quickly and efficiently. Additionally, all our technicians speak English. Furthermore, we take very good care of our employees so they are happy and focused on their job! How long will it take for the technician to arrive? In case of lockout our technician can get to you in 30 minutes or less! Need us to come immediately? Call us direct! We provide superior and very fast service and no charge for call-outs! We offer crystal clear prices and fees. No extra charges for nights, weekends or holidays! You can pay cash or use your credit card. In case our technicians fail to open your door or repair a lock, we will not charge you! Of course you can pay by credit card! Lock-outs and broken locks do not occur when it is convenient, so we usually don’t carry a lot of spare cash just in case. When customers call us they are often concerned about payment. Don’t worry: our technicians are all equipped with iZettle Card terminals (PIN readers). You can use practically any credit card to make a payment. This cuts down on unnecessary waiting or visits to an ATM machine. 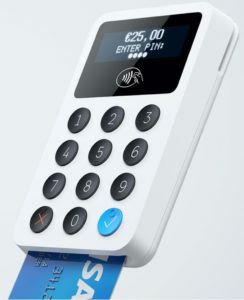 When the work is finished to your satisfaction the technician will hand you the Card reader and all you need to do is insert your credit card (Mastercard, Maestro, Visacard, Amex and all local banks accepted) and you enter your 4 digit PIN code. After this, you may enter your e-mail address or telephone number to receive a digital receipt. This receipt is your guarantee as well as proof of payment. 5 year, 100% warranty on all products and services! Our technicians are certified professional locksmiths and will expertly open all doors without unduly damaging them. * The standard fee for door opening without damage, replacements or repairs is ± € 85.- including VAT. (Special discounts — up to 15% — in some areas of Den Haag). When making an appointment, please always ask for an estimate to avoid surprises! A-keys | Slotenmaker Den Haag (SDH) is an all-round locksmith company and we do more than just open doors and replace cylinders. We can also place new locks and cylinders, bars on windows, design a variety of security measures and construct them ourselves (e.g. bullet-proof doors). With the right equipment and our expertise we can significantly improve your security and protect you and your property from any risk or threat: burglary, break-in, theft and so on. Due to the rising number of burglaries, break-ins, robberies and crimes in The Hague we get a lot of questions about prevention and security. Are you aware that placing new security locks and cylinders with the SKG*** certificate can significantly reduce the chances of a break-in by almost 90%? We provide a wide range of locks and cylinders with the SKG*** security certificate and know how to fit these materials professionally to make sure that you and your valuables are safe. Fastest service in case of lockout! Don’t panic! We will be with you within 30 minutes! Baaoe.nl is een site gericht op bouw, doe-het-zelven en verbouwen.